Matt black is beautifully minimalistic with its downplayed, dark presence in perfect contrast with the modern look of many kitchens and bathrooms. The matt black surface won’t fade over the years and is resistant to dirt and greasy fingerprints. In steel (PVD), Silhouet is the discreet and elegant alternative to chrome that will fit in almost any kitchen and bathroom environment. With its special PVD coating, Silhouet Steel offers a harder, extremely robust surface that easily withstands scratches, corrosion and discolouring. Polished Brass (PVD) is the stylish Silhouet choice for bathrooms and kitchens designed with a nod to nostalgia. Silhouet in brass also features the extra tough and highly durable PVD coating. 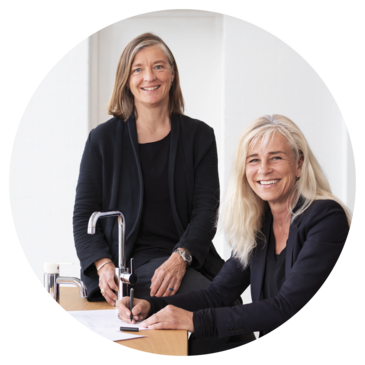 Award winning Danish industrial design firm Halskov and Dalsgaard, established in 1990 by Christina Halskov and Hanne Dalsgaard, helped Damixa bring Silhouet to life. The duo's work is deeply rooted in the Danish/Scandinavian design tradition and integrates aesthetic and functional design. Halskov & Dalsgaard has designed products for, among others, Stelton, Holmegaard, IKEA, Coloplast and Sticks'n'Sushi.